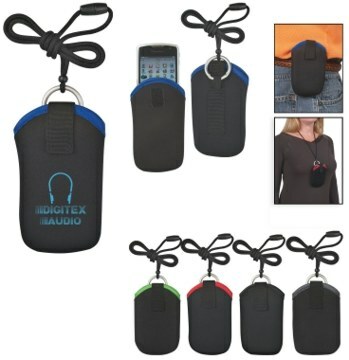 Wholesale Personalized Neoprene Neck Rope -Lanyard Cell Phone Holders. Promotional, Inexpensive. Budget Prices for USA, Canada. Lime Green, Blue, Red or BlackBest price in USA, Canada. Black with Lime Green, Gray, Blue, Red or Black Trim. Also hold PDA, MP3, etc. Bulk discount cell phone holders (sleeves), customized with your logo. We also supply blank (not imprinted) bulk cell phone sleeves for $1.35 each (minimum quantity: 250). Our versatile cell phone holder is great for everyday use, as well as outdoor activities, such as jogging, running, etc. This great novelty cell phone holder is US patent pending. Budget Prices in the USA and Canada for personalized lanyard cell phone holders. Free artwork design. American clients pay no taxes. Packaging: individual vinyl bag with instructions. Typical Production Time: 7 days after artwork approval. Prices include your 1 color, 1 side imprint. We also supply blank (not imprinted) bulk cell phone sleeves for $1.35 each (minimum quantity: 250). Setup Charge: $45.00 per color; $25.00 on re-orders. Extra Imprint Colors: add $0.25 per color. Call us to place an order or fill up the Order Form below. Our artwork design is free and we will Email you a proof for your approval before production. We will add the most economical shipping charge by UPS Ground, unless you instruct us otherwise.